Facebook has hired Geohot, the popular hacker behind the iPhone and Sony Playstation jailbreaks, reports TechUnwrapped. Joshua Hill (P0sixninja) recently mentioned in an interview that Geohot is trying to avoid the limelight after his legal battle with Sony and is concentrating on his day job at Facebook. Gabe Rivera of Techmeme reports that Geohot started at Facebook in May and announced it on his Facebook account on June 17th. His last wall post says, "Facebook is really an amazing place to work...first hackathon over." 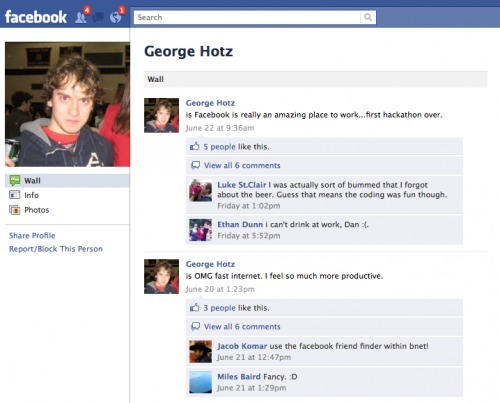 We wish Geohot the best of luck at Facebook but also hope he has some time left to contribute to the iPhone community.